Monday’s first round of the 65th Illinois Open was full of surprises, the most notable of which was provided by Michael Davan. Davan, from downstate Hoopeston turned pro after playing collegiately at Indiana-Purdue Indianapolis. Starting late in the day he shot a 6-under-par 66 to take a one-stroke lead into Tuesday’s second round at The Glen Club in Glenview. Starting his round at No. 10, Davan made five birdies in a six-hole stretch at the end of his first nine. That was an indication he put last year’s Illinois Open nightmare behind him. Davan took a one-stroke lead into the final hole before a water ball led to a double bogey. In Monday’s round he lost a playing partner when Wheaton’s Tee-k Kelly, winner of the 2013 Illinois State Amateur, was taken by ambulance to a nearby hospital after complaining of dehydration. Kelly returned to the course late in the day after undergoing treatment. While Davan was the first-round’s hottest player two of the more established professionals struggled mightily. Mike Small, the University of Illinois men’s coach, shot 77 and Curtis Malm, the Illinois PGA Player-of-the-Year the last two seasons and now head at White Eagle in Naperville, shot 79. Both will have to improve to survive the cut after today’s round. The low 50 and ties advance to Wednesday’s final 18. Small, a four-time champion in the event, had some consolation in that one of his Illini players was just one shot off the first-round lead. 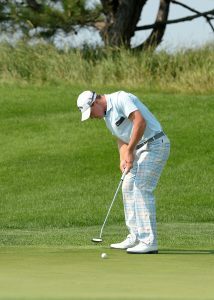 Alex Burge, a senior from Bloomington, made four birdies in his first five holes en route to posting a 5-under-par 67. Burge is one of a record 81 amateurs in the 156-player field. Shot of the day was Steve Orrick’s 7-iron on the 193-yard 17th hole. It dropped for a hole-in-one, but Orrick, the head pro at Country Club of Decatur, settled for a 3-over 75. Defending champion Joe Kinney, of Antioch, opened with a 71 and is one stroke better than two other recent winners, Wilmette’s Eric Meierdireks (2011) and Chicago’s Max Scodro (2012). Naperville’s Ray Knoll, soon to be a freshman at the University of Iowa, followed his victory in last week’s Illinois State Amateur at Cantigny in Wheaton with a 74.